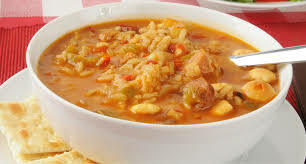 Asopao de Pollo &nbsp;(Chicken Soup) - Tienditadepuertorico.com - Buy Puertorican Food Here!! saute the ham over medium heat. Add the recaito, tomato sauce, and alcaparrado.